Known associations of KP include atopy (55%),  ichthyosis vulgaris,  scarring alopecia,  cardio-fascio-cutaneous syndrome,  ectodermal dysplasia ],[ KID syndrome,  obesity,  prolidase deficiency  and Down's syndrome. Conditions presenting as keratotic follicular papules may be considered in the differential diagnosis of KP. These include phrynoderma, follicular eczema, follicular lichen planus, juvenile pityriasis rubra pilaris, acne vulgaris, acneiform drug eruption, trichostasis spinulosa, ichthyosis follicularis, scurvy, eruptive vellus hair cysts and perforating folliculitis. The pathogenesis of KP is still not well understood. The most accepted theory proposes defective keratinization of the follicular epithelium resulting in a keratotic infundibular plug. We decided to test this hypothesis by doing dermoscopy of patients diagnosed clinically as keratosis pilaris. We correlated the findings with the clinical features in these cases to further our understanding of the disease. A cross-sectional, observational study was conducted on 25 patients who presented to our outpatient department between September 2011 and December 2011 and were clinically diagnosed with KP. A clinical history was obtained; examination and dermoscopic evaluation were performed on the lesions of KP. The dermoscope used was a triple light source, non-contact, videodermoscope (Ultrascan© , Dermaindia) and patients were evaluated using both the white light and polarizing light. Still images of the lesions were shot and later analyzed and correlated with clinical features. The age of the patients who underwent dermoscopic examination ranged from 6-38 years with average age of 18 years. The male:female ratio was 1:2. Of the 25 patients included in the study, 16 patients had history suggestive of atopy. Nine patients had concomitant ichthyosis vulgaris. One other patient had concomitant follicular eczema. All the 25 patients were found to have circular, twisted or coiled hair shafts within the affected follicular infundibula which could be extracted using a 26G needle. Six patients were found to have small papules of keratosis pilaris; 19 had larger lesions. Dermoscopic examination with white light revealed that all the small papules of KP had a coiled or semicircular intermediate hair embedded superficially in the epidermis. None of the small lesions had perifollicular erythema or perifollicular scaling [Figure 2]. In larger lesions, a coiled hair shaft was visualized emerging from the infundibulum. 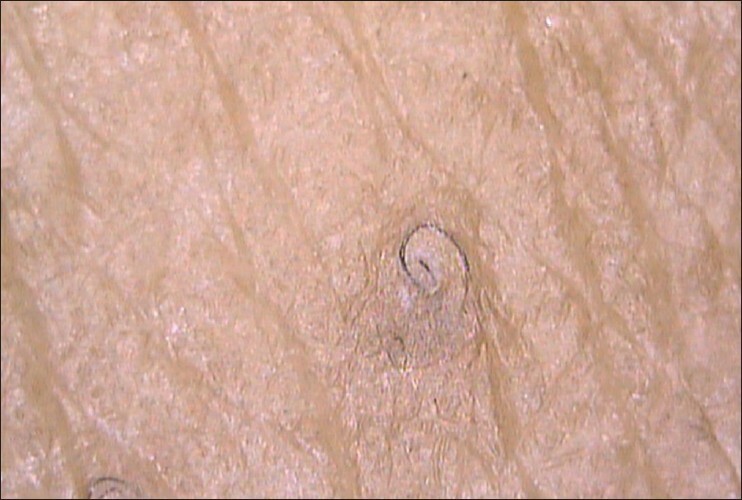 The hair shaft formed a semicircle in 3 patients and a loop in 5 patients [Figure 3]. 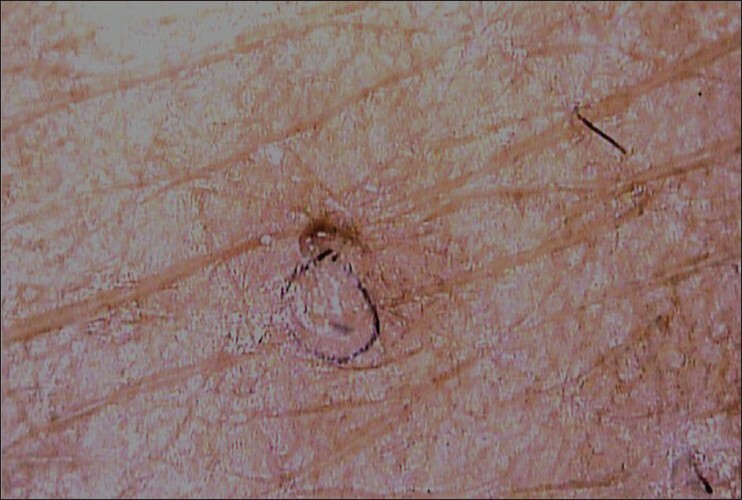 Even after the coiled hair shaft, embedded in the uppermost epidermis was dislodged from it with the help of a needle, it continued to maintain its coiled nature [Figure 4]. Perifollicular erythema was seen in 11 patients. 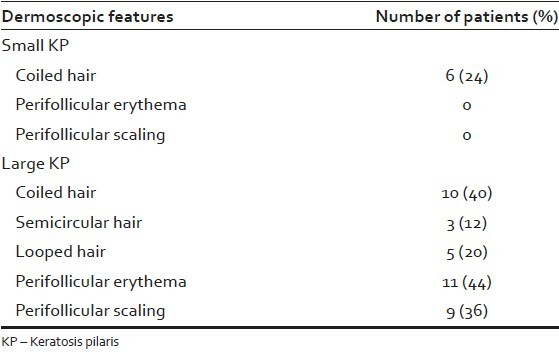 Perifollicular scaling was seen in 9 patients [Figure 5], [Table 1]. Three of the female patients had undergone waxing for hair removal prior to the dermoscopic evaluation but coiled hair could be visualized embedded in the superficial epidermis even in these cases. It was noted that perifollicular erythema was more prominent in these cases. Currently available treatment modalities for KP include various keratolytics, vitamin D3 analogs, topical systemic retinoids and various laser therapies. In spite of the availability of such a multitude of treatments, satisfactory clinical outcomes are rare. This prompted us to evaluate the clinical and dermoscopic features of KP and review the etiological hypotheses. Upon dermoscopy, we consistently found circular hair shafts mostly within normal-appearing follicular openings. 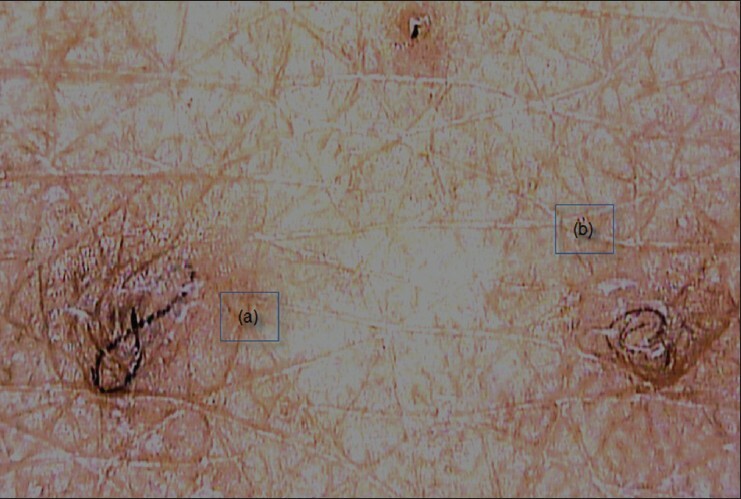 White light examination revealed the clinically visible follicular papules harboring a circular hair shaft embedded in their sides, but sans follicular plugs. At times, these papules showed the hair to be thicker and forming larger coils embedded in the superficial epidermis. 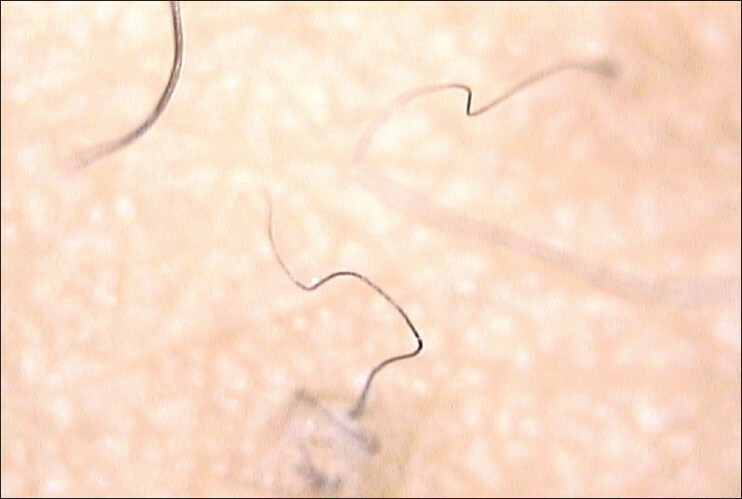 These hair shafts were found to retain their coiled nature even after they were extracted from the follicular plugs, indicating that the defect in KP may not be of keratinization, but of the circular hair shaft which ruptures the follicular epithelium, leading to inflammation and abnormal follicular keratinization. Waxing exacerbated the lesions probably secondary to an increased perifollicular inflammation secondary to trauma. Even though keratosis pilaris is a common clinical diagnosis, little is known about its etiology. It was considered to be a defect in the follicular keratinization, though dermoscopic examination did not support this theory. We propose that KP is primarily caused by a hair shaft defect. Further studies are required to evaluate the role of laser hair removal in the treatment of KP to reinforce this hypothesis. 1. Alai NN. Keratosis pilaris. Emedicine. Available from http://emedicine.medscape.com/article/1070651-overview [Last updated on 2012 Mar 23 2012] [Last accessed on 2012 Mar 03]. 2. Judge MR, McLean WH, Munro CS. Disorders of keratinization. In: Burns DA, Breathnach SM, Cox NH, Griffiths CE, editors. Rook's textbook of dermatology. 7 th ed. Oxford, England: Blackwell Publishing; 2004. p. 34. 60-34. 62. 3. Rogers M. Keratosis pilaris and other inflammatory follicular keratotic syndromes. In: Wolff K, Goldsmith LA, Katz SI, Gilchrest BA, Paller AS, Leffell DJ, editors. Fitzpatrick's dermatology in general medicine. 7th ed. New York: McGraw Hill; 2008. p. 749-53. 4. Ebling FJ, Marks R, Rook A. Disorders of keratinization. In: Rook A, Wilkinson DS, Ebling FJ, Champion RH, Burton JL, editors. Textbook of dermatology. 4 th ed. Oxford Blackwell Scientific Publication: 1986.p. 1435-6. 5. Mevorah B, Marazzi A, Frenk E. The prevalence of accentuated palmoplantar markings and keratosis pilaris in atopic dermatitis, autosomal dominant ichthyosis and control dermatological patients. Br J Dermatol 1985;112:679-85. 6. Romine KA, Rothschild JG, Hansen RC. Cicatricial Alopecia and Keratosis Pilaris. Keratosis follicularis spinulosa decalvans. Arch Dermatol 1997;133:381-2. 7. Pierard GE, Soyeur-Broux M, Estrada JA, Pierard-Franchimont C, Soyeur D, Verloes A. Cutaneous presentation of the cardio-facio-cutaneous syndrome. J Am Acad Dermatol 1990;22:920-2. 8. Chitty LS, Dennis N, Baraitser M. Hidrotic ectodermal dysplasia of hair, teeth, and nails: Case reports and review. J Med Genet 1996;33:707-10. 9. McHenry PM, Nevin NC, Bingham EA. The association of keratosis pilaris atrophicans with hereditary woolly hair. Pediatr dermatol 1990;7:202-4. 10. Barth J, Wojnarowska F, Dawber R. Acanthosis nigricans, insulin resistance and cutaneous virilism. Br J Dermatol 1988;118:613-9. 11. Kokturk A, Kaya TI, Ikizoglu G, Koca A. Prolidase deficiency. Int J Dermatol 2002;41:45-8. 12. Daneshpazhooh M, Mohammad-Javad NT, Bigdeloo L, Yoosefi M. Mucocutaneous findings in 100 children with down syndrome. Pediatr Dermatol 2007;24:317-20. 13. Hwang S, Schwartz RA. Keratosis pilaris: A common follicular hyperkeratosis. Cutis 2008;82:177-80. 14. O'Regan GM, Sandilands A, McLeanWH, Irvine AD. Filaggrin in atopic dermatitis. J Allergy Clin Immunol 2009;124:R2-6. 15. Brown SJ, Relton CL, Liao H, Zhao Y, Sandilands A, Wilson IJ, et al. Filaggrin null mutations and childhood atopic eczema: A population-based case-control study. J Allergy Clin Immunol 2008;121:940-6. 16. Barth JH, Wojnarowska F, Dawber RP. Is keratosis pilaris another androgen-dependent dermatosis?. Clin Exp Dermatol 1988;13:240-1. 17. Yosipovitch G, Mevorah B, Mashiach J, Chan YH, David M. High body mass index, dry scaly leg skin and atopic conditions are highly associated with keratosis pilaris. Dermatology 2000;201:34-6. 18. Gerbig AW. Treating keratosis pilaris. J Am Acad Dermatol 2002;47:457. 1 Unilateral keratosis pilaris occurring on linear hypopigmentation patches: A new variant of keratosis pilaris in an Asian?